Capt Merle R. Hungerford (P) - Flew as CoPilot with five different Pilots on eight missions (10, 55, 59, 66, 67, 77, 81, 90). Upgraded from CoPilot to Pilot on orders dated 26 October 1944. First missions as 1st Pilot on 26 November 1944. Flew five credited missions as 1st Pilot with two different CoPilots: 2Lt John F. Henderson (83, 85, 86); 2Lt Karl B. Arundale (95, 99). T/Sgt Vosler and Sgt Buske were from neighboring small towns in Orleans County, New York, but had never met until they were assigned to the same combat crew. Vosler was from Lyndonville and Buske was from Clarendon, just 27 miles down the road. Both towns had less than 3,000 residents. 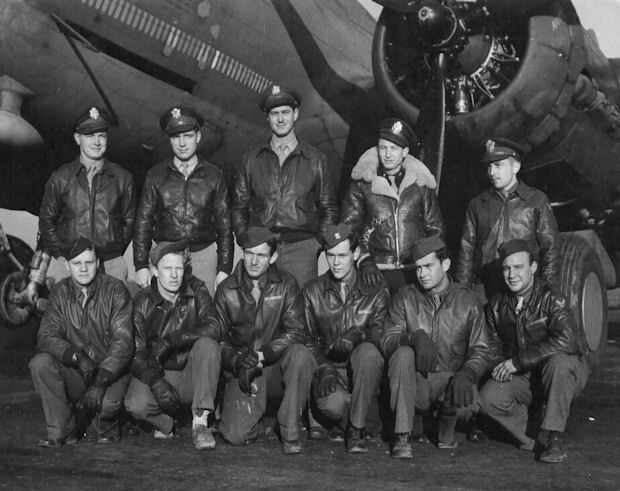 On 20 December 1943 Mission #90 to Bremen, Germany, B-17 Jersey Bounce, Jr. #42-29664 piloted by Lt. Henderson, was forced to ditch in the North Sea. S/Sgt Forrest L. Vosler (R) was awarded the Medal of Honor for his exploits on that mission. All crewmen were rescued and returned to Molesworth. Sgt Buske was badly injured.